The title says it all...though we are not in the Midwest where so many of you have it so much worse than we do. But, still.....It is snowing again and the wind has really picked up. A moment ago our backyard was one big whiteout. We were pretty hungry and tired when we got home, so threw together some leftovers and then took naps. Or tried to. Fletch got comfy on the sofa and I went upstairs to lay down on the bed. I was just about asleep when I heard a banging at the back window. I opened my eyes and there was Tyg hanging onto the bottom ledge of the window. He had climbed up onto the patio roof and then jumped up to hang by his front paws. I got up, opened the window and hauled him in. I never got to sleep, but it felt wonderfully relaxing to just lay in bed for an hour or so. A luxury! Tomorrow I plan to go into work very early. I have some reports I need to get out. I'll leave by 11 though to take Fletch to his follow up appointment with the eye doctor. What can I say? Another afternoon off is not bad. As Bonny talked about the other day, you can knit people you love safely home. I also believe you can knit those you love safely through surgery. I did knit this a.m. and am a little further along on the sockhead cowl (which is PERFECT waiting room knitting). Bonny's post the other day on her Hitchhiker shawls finally pushed me over the edge and I bought the pattern right after reading her blog! This afternoon I found what I think will be an excellent yarn for my very first Hitchhiker. I'll show a picture once I start, but it is Kettle Dyed yarn I bought in Lancaster the other year. The colorway is Rhubarb. It is beautiful. I tried making socks with it and the yarn pooled in an unattractive/ugly way. I think it will work well with the Hitchhiker pattern. I also picked out my yarn for the KAL Dee and I are starting on Saturday (socks in the pattern Sunday Swing - free on Ravelry). I know Val is joining us...any others? Dee also convinced me (with her post on Tuesday) to go through my stitching WIPs. Egads...I have 6 large pieces (mostly samplers) in some stage of completion and 5 (or more - I didn't dig that deep in the chest) "smalls" in progress. This is the year I will start stitching again. I've missed it. Stay tuned! In the middle of writing this post, my laptop shut down. Grrrrr. So, I'm going to hit publish while I can. Stay warm!!! The yarn is behaving! The yarn is wonderfully soft and warm. I know this will feel wonderful around my neck. 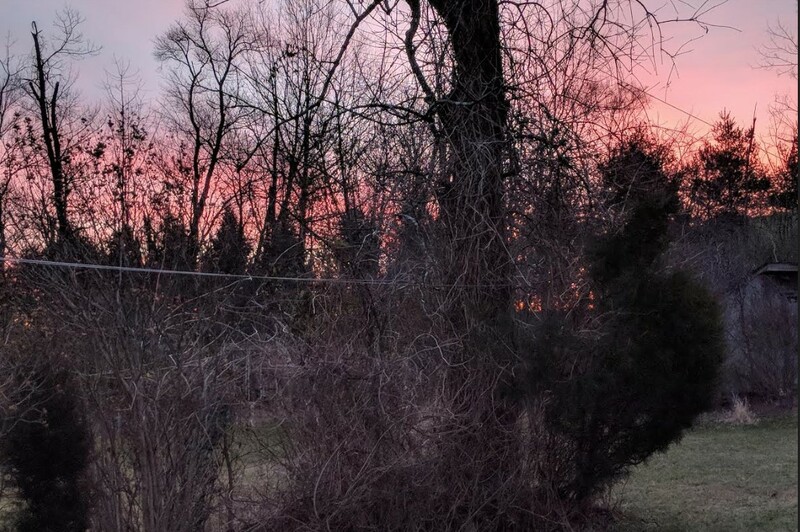 Saturday was a beautiful morning - warmish (45 or so) and sunny. Now we are back to chillier temps and by Wednesday the thermometer should drop a lot...I think our low is forecast to be 2 degrees. However, that's nothing compared to what the mid-West will be experiencing - stay warm!!! Stay inside and knit!!! This will be a busy week for me. Fletch is having cataract surgery on Wednesday and, of course, I have to take him. And then on Thursday, he has a follow up appointment which I will have to take him to. Not sure what time that is, so my work schedule will depend on that. Fingers crosssed his surgery goes well. Meanwhile I seem to have come down with a nasty cold which I am hoping to kick by Saturday when Dee and I have plans to head over to Purls of Wisdom for a trunk show!! It is warmer today (33 degrees!!) and rain is in the forecast. It is supposed to go up to 53 and I've already received texts and e-mails regarding potential flooding for the area. It has been - and continues to be - a roller coaster of a winter. This week has definitely seen more unraveling than I've done in a long, long time. First up the Brookline Socks (free pattern on Ravelry) that Dee and I started knitting on Saturday did not work. 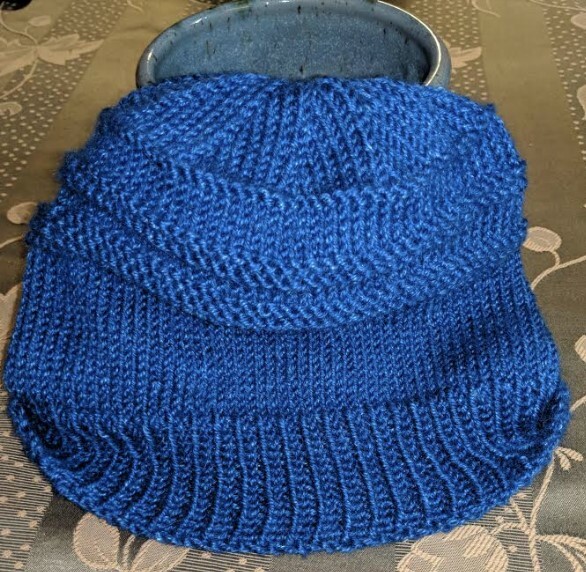 Then I tried a sockhead cowl - somehow I messed that up as well. Next I picked different yarn and started Gladys socks (another freebie on Ravelry). That did not work. I had woken from a nap on Monday dreaming that I was doing some cross stitch so I pulled out several small pieces "in progress" to work on. Last night I looked at the first and found a mistake I had made (long, long ago). Ended up cutting that out of the linen. Bottom line: I need to LISTEN to the yarn. My blue yarn with flecks of copper (Madtosh I believe) does not want to be a cowl. 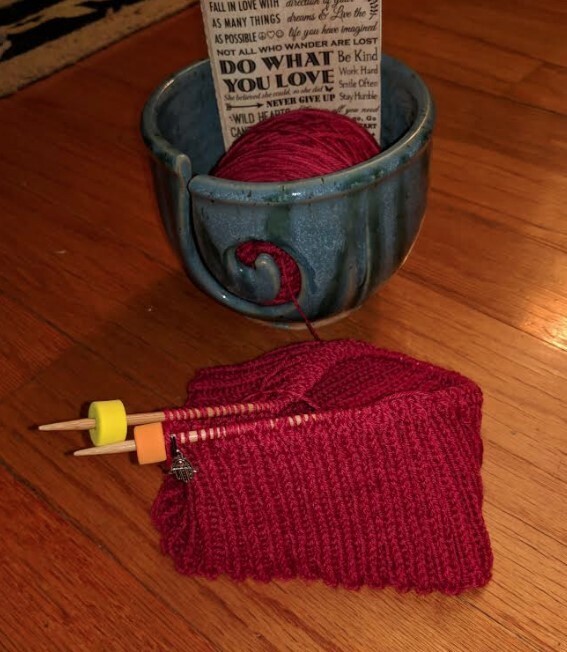 My red yarn does not want to be socks. 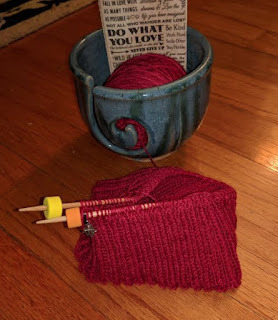 So last night, using the red yarn, I cast on for a sockhead cowl. Hopefully this one will cooperate!! I've brought it to work and am looking forward to a nice lunch time (raw veggies and a little cheese) with knitting. On the reading front I have not been doing much. I'm still reading "As Bright as Heaven" and enjoying it...but haven't picked it up for several days. Last night I started reading "Where the Crawdads Sing" on my Kindle...but I had only read 3 pages or so and my eyes began to close. That's where I am this Wednesday - joining in with Kat and friends. What are you up to? So nice to have the day off. It is bitter outside. It finally just got up to 11 degrees. Lots of strong winds rattling the windows. Tyg is not interested in going out, but he has a couple of times...just not for very long. Right now he is curled up in the chair I normally sit in to knit. It's at the end of the table and the heat comes out under the table - it's a comfy place to be! IF you remember, Dee and I were getting together on Saturday for some shopping, knitting, lunch, and a whole lot of chatting. Apparently I cannot chew gum and walk AND I cannot cast on and talk. Not sure what I did, but Dee can confirm that the ribbing I started for some socks was just plain wonky. Neither of us could figure out what had happened. I planned to cast on anew later that evening. 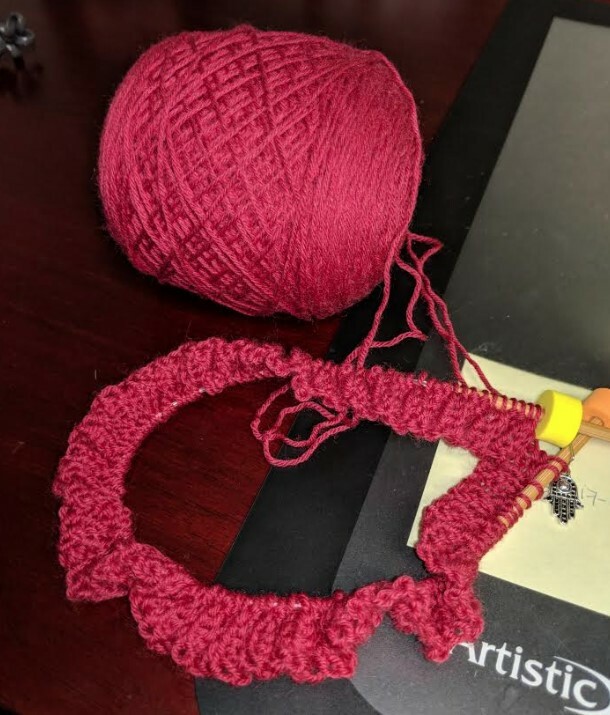 Before I had a chance, Dee texted me that the Brookline pattern was not working for her yarn. 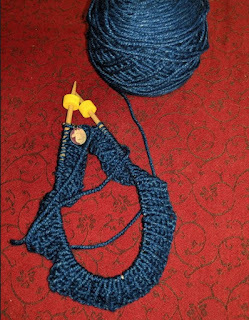 We've decided to abandon that little mini KAL and start one on the 2nd of February for Sunday Swing socks (free pattern on Ravelry). Anyone care to join us? 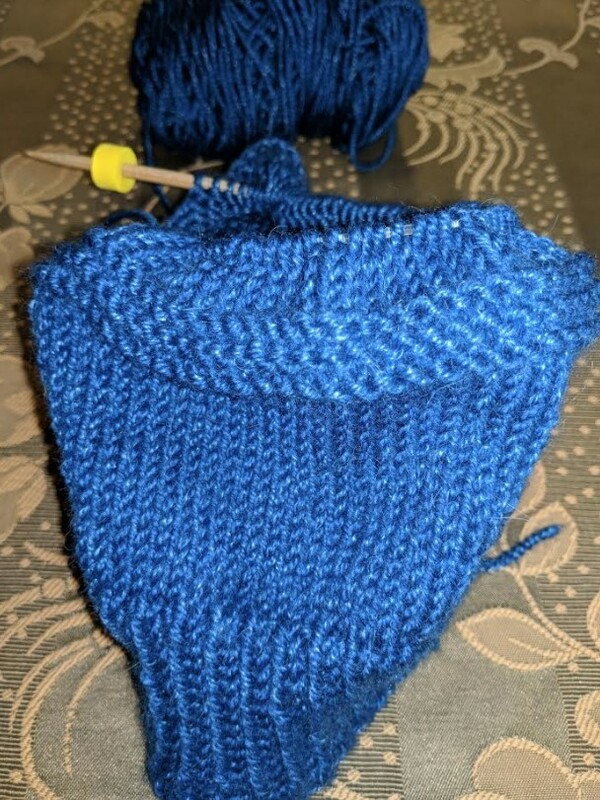 Last night I was finally able to cast on for socks but only managed to get 5 rows of ribbing done. Hopefully this will see a little more action today. I'm planning to make "Gladys" (another free one on Ravelry). But I have not been idle. Last night I went through the notebooks I have of patterns. You know I weeded them out months ago, but still had too much. I've whittled it down and am getting rid of 4 binders! A lot of what I had printed is already in my Ravelry library...or is free on the internet. I did save some patterns I bought and some instructions I had printed out. I've also been going through books - some from my knitting bookcase and more from a shelf of cookbooks. I have a large box of books to donate. And space! I have space. It feels wonderful. Meanwhile, my car is in the shop for inspection (which is going to be expensive this time). It may not be ready till 10 tomorrow morning. I have laundry in both the washer and dryer, and a couple more loads to do. Bread is rising (the kitchen smells wonderful) and I'm making a curried shrimp chowder for dinner. It's the perfect day for soup and bread. Colin and Mailing made it home safely from NYC and they LOVED the opera. Luckily the storm wasn't as bad as predicted. It's just the bitter cold and the wind - unrelenting! 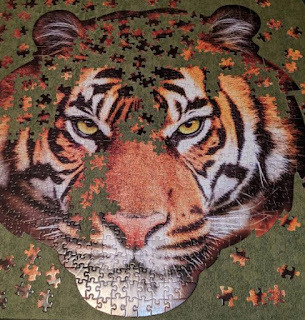 This has got to be the hardest puzzle I've ever done! It's easy to lose an hour or so just staring at this and trying to find a piece or two that fit in. So, we had a bit of snow (1" or so) over night and more predicted for today...Saturday...and Sunday. BUT, it doesn't look like the storm will be as bad for us as originally predicted. The main problem will be Sunday when it is supposed to rain and then the temps are forecast to drop to 5. That's when it will all freeze up. Luckily my office is closed on Monday for MLK Day. Meanwhile - fingers crossed for Colin & Mailing who have their house inspection this morning. After that they are heading to NYC for the weekend (where they will most likely have more snow). I was hoping they would postpone their trip, but they have a non-refundable hotel booked and non-refundable tickets to the Met on Saturday (Debussy's Pelléas et Mélisande). That means Fletch and I are on cat feeding duty beginning tonight through Sunday morning. Also - if you saw Dee's Blog you know she and I are meeting up tomorrow for some therapy - lol - and will be starting a little KAL for Brookline Socks which look like a fun knit. Dee's chosen yarn is GORGEOUS. I *think* I've picked my yarn...I need to re-look at my stash tonight before making a final decision (or find something at one of the stores we will be visiting tomorrow???). My first conference call has ended, but I have another one in 30 minutes...I'd best get ready for that. Wishing you all a cozy weekend! Gosh it is cold outside...and colder weather (and snow) is forecast for our weekend. 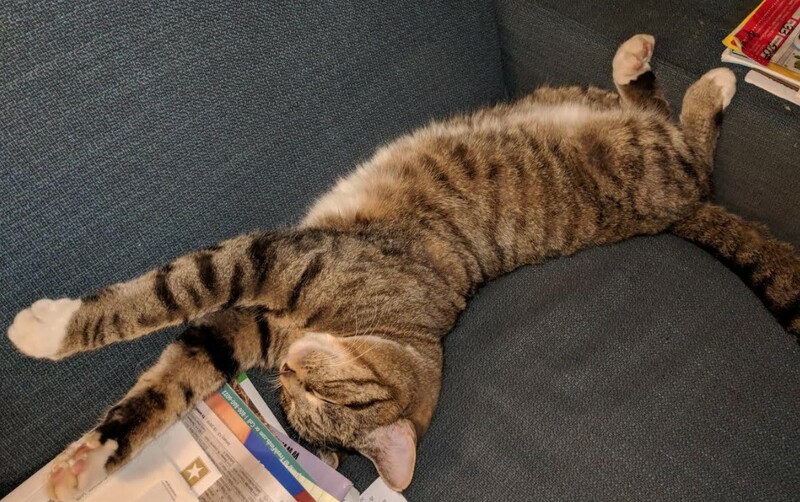 Colin & Mailing are heading to NYC on Friday for a weekend get-away and we are on cat duty...hopefully we won't have any issues getting up to their place to feed and play with Talbot & Marcel. How did it get to be the middle of January already? Last night I wound the yarn for Fletcher's cowl and knit a little swatch. It is so soft. 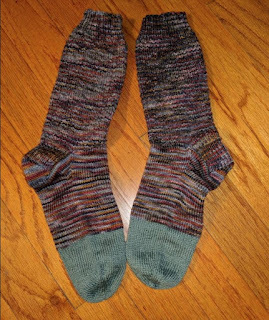 The yarn is from Ancient Arts Yarn - Revival Worsted in the colorway "Birch Leaves." It's a blend of 49% wool; 34% mohair; 11% nylon; 4% acrylic and 2% silk. This will be knit flat as Fletch wants it to button. There will be ribbing at the top and bottom and the middle will be a small pattern (you can see it better in the swatch in the first picture....and see my scribble of it in the second picture). I measured his neck (and did not pull the tape too tight). Today I will graph out the pattern (I need to work out the maths as they say in Britain) and work out buttonholes in it. Hopefully I can start knitting at lunch! On the reading front, I am about halfway through As Bright as Heaven and am finding it a good read. Last night Fletch and I FINALLY finished Benjamin Franklin: An American Life - it seemed to take forever to read this. It was good, but parts of it dragged for us and it was difficult at times to read more than 10 pages out loud after dinner. Glad to have read it (learned some things about Ben that I hadn't known), but glad to have it finished as well. Up next I think we are doing a palate cleanser - something quick and easy - a spy-type thriller in the lines of Dan Brown or Robert Ludlum. I can't remember the name of it. Joining in with Kat and others on this Unraveled Wednesday. What are you all up to? Another very chilly morning (in the teens), but my head was warm! I finished the hat last night. It's not blocked but it fits very well and it's cold out, so I wore it today. Just 15 rows of ribbing, then a bunch of plain knitting. When I got a bit bored, I added 3 garter ridges, more stockinette, then 2 garter ridges, more stockinette and one garter ridge, then the crown decrease. I have just enough yarn left to make a nice pom-pom which I *might* do. Or, I may get one of those furry pom-poms to put on it. I haven't decided yet. Tonight I'll wind the yarn that came in for Fletcher's cowl and knit a swatch and then design that. I'm looking forward to doing something different. Of course, I'll need to measure Fletcher's neck and I told him I promised to not draw the tape measure too tightly - lol. 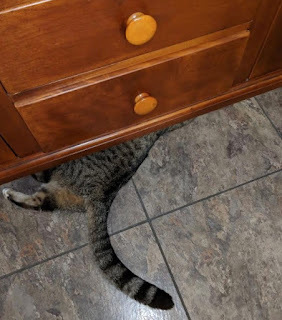 While I was knitting in the kitchen last night, Tyg was playing with several different toys and batting them under the buffet. He would scoot under and then suddenly the toy would come flying out - he would make a good hockey or soccer player. Still reading "As Bright As Heaven" and enjoying it. It's nice to read a "real" book for a change...though it is a bit heavier than my Kindle. Here we are at another Monday already! And a cold one (like 20 degrees cold). We did wake up to a dusting of snow on Sunday and a few flurries during the day, but nothing much - I think South of us was hit a bit harder. The weekend was nice and started early! First we had breakfast at work (eggs, bagels, meats, etc.) and then we got an e-mail that there would be Eagles snacks in the main kitchen at 1 (which apparently didn't help the Eagles yesterday) and our office closed at 2:30! I actually managed to be productive when I got home and scrubbed both bathrooms, did a couple loads of wash and then made pizza for dinner! Saturday dawned bright, but bitter cold. I headed up to The Broad Street Grind to meet Dee for some sipping and knitting and chatting. As always, we had such a nice time. 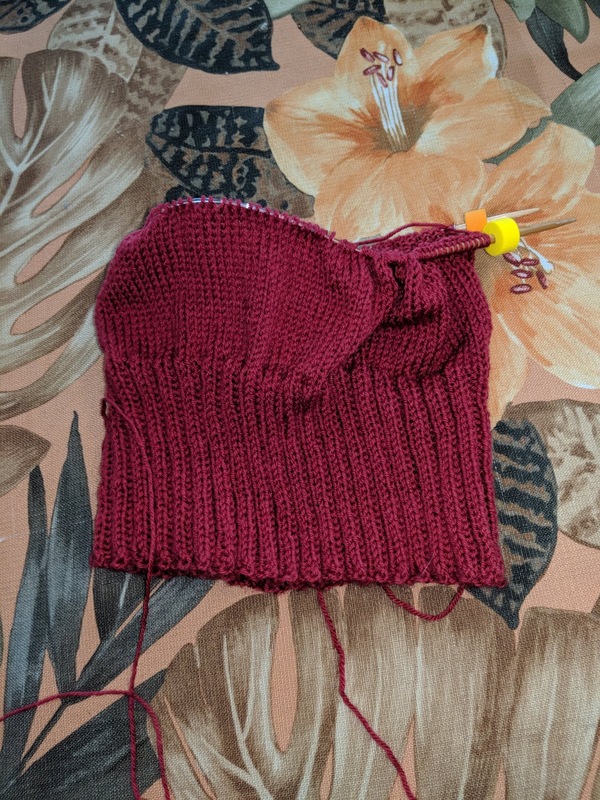 I worked on my hat a bit. I added some garter rows. I'll do a bit more (and a few more garter rows) before I start the crown decreases. 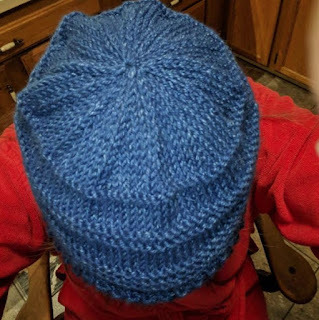 The yarn is so soft and warm (I did try it on my head and it fits - yay!!). I just need to Finish it. Saturday I also drove past the house that Colin & Mailing are buying since I had not seen it in daylight - so cute!! And their offer was accepted last week. I believe settlement will be in February. We are so happy and excited for them. While I was out with Dee, Fletch un-decorated the tree and put all the ornaments away. Finally! The house is back to normal and clean, which makes me a happy person. Sunday I ran a couple of errands, thoroughly cleaned the kitchen, took a 2 hour nap (which explains why the hat is not yet finished). All-in-all, a lovely weekend. Now it's back to the grind....wishing you all the best kind of week! When I left work just before 4 p.m. yesterday, my car was covered in slushy sleet…and again this morning, but it is above freezing and actually pretty foggy outside. 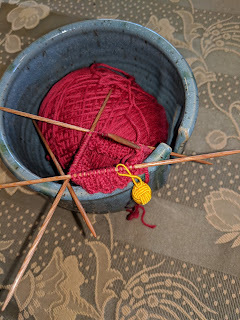 I decided that before too much more of January skips by us I should do a reading and knitting review of 2018. I don’t set goals or anything…I just like seeing what I did. Nice that 27 were rated 4 * or above. My favorite book overall for 2018 was “20,000 Leagues Under the Sea” by Jules Verne (read with Fletch after dinner). And there you have it! 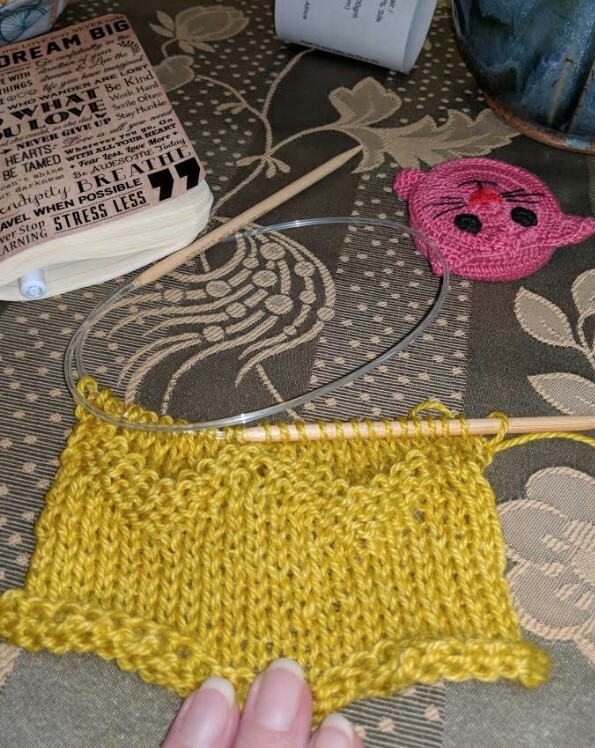 My Knitting/Reading journal for 2019 has already been started with a finish in each category. Again, no goals, but I will be curious to see how 2019 stacks up compared to 2018. More on that in another year – lol. Today should be a little busier for me than yesterday was – starting with a financial conference call at 10:30. But, knitting and reading have been brought to work (I did start a hat yesterday at lunch time). Wishing you all the best that this Tuesday may bring you. That's what I saw this morning as I left my house later than normal (I had a bit of trouble getting my motor going this morning...I wanted to crawl back into bed). He obviously has no shame at all - lol. He has also been enjoying dozing under the Christmas tree (let's not discuss that it is still up...). Last week I finished The Feather Thief which I enjoyed. My first reading finish for 2019! It ended up being shorter than I expected (because of so many pictures at the end) and I thought it ended rather abruptly, but still a good read. Since I read it on my Kindle, I want to go to the library to look at the *real* book so I can see the pictures in color. I've started reading Life in the Garden but am not thrilled with it so far. However, I've only read a small amount, so will try a bit more. 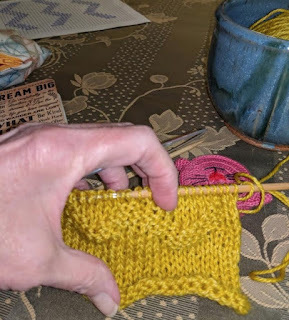 Best of all, I had my first knitting finish of 2019. The Arctic Fox socks are off the needles and waiting for Colin to come over at some point. I wish the solid color at the end of the foot wasn't quite so large...but it had to be in order for the socks to fit. There is just a small amount of the other yarn left. Overall I'm pleased with them and more than ready to move on to something else. Yarn for Fletcher's cowl is on its way to us, so there is that. And today I brought a new skein of blue yarn to work to hopefully cast on for a hat for moi! 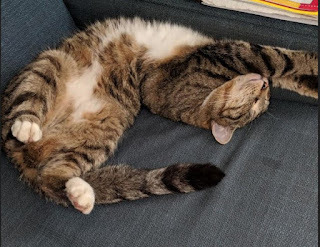 Fletch and I watched the first episode of Killing Eve last night. I'm not sure about it - it might be a bit intense for me and I'm not a huge Sandra Oh fan. Fletch really liked it. We watched it on Hulu and I was annoyed by the commercials...so that may be part of my problem with it also. I'm spoiled with Netflix and Acorn TV. Have any of you seen it? Today should be a relatively easy one at work, so I'm looking forward to having a relaxing lunch (with knitting/reading). On my drive into work this a.m., I heard on the radio that we have a chance of sleet after 2 a.m. tomorrow and then, possibly, some snow. Hopefully nothing too much!! So far I've done a good job of writing 2019 rather than 2018...I'm sure I'll slip back at some point. Anyway, TGIF! It has been easier than I expected getting back to work (but I'm missing my days at home) probably because it has been busy. I'm ready for the weekend. No real plans other than going to Costco tomorrow with Colin (wishing our Costco sold wine...). I may try to hit the outlets as well. I love Ann Taylor and Loft clothes and ended up with six (6!!!) $12.50 coupons from them (part of a class action suit), so that adds up to $75 off. Woo-Hoo! I don't really *need* anything, but maybe I could refresh a top or two...or a sweater...or find a gift for a friend. Colin was over last night an we played some Cribbage (which I won!). 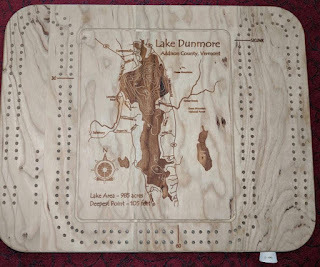 Lake Dunmore is near where I spent time every summer. A friend of my Mom's had a camp on the lake and we would spend at least a month each summer there. 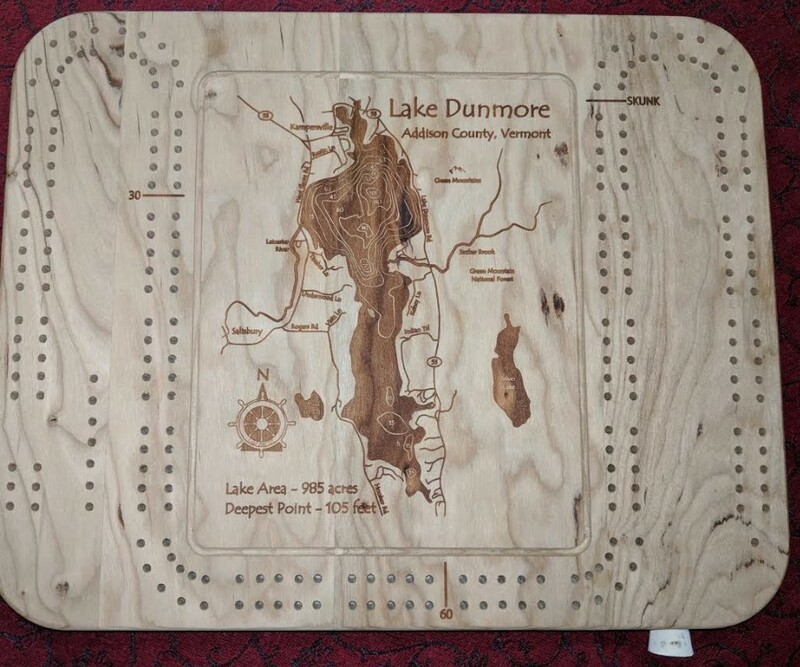 The map of the lake is like a topographic map in that it shows the varying depths of the lake. The smaller lake to the right is Silver Lake which we used to hike to each summer. 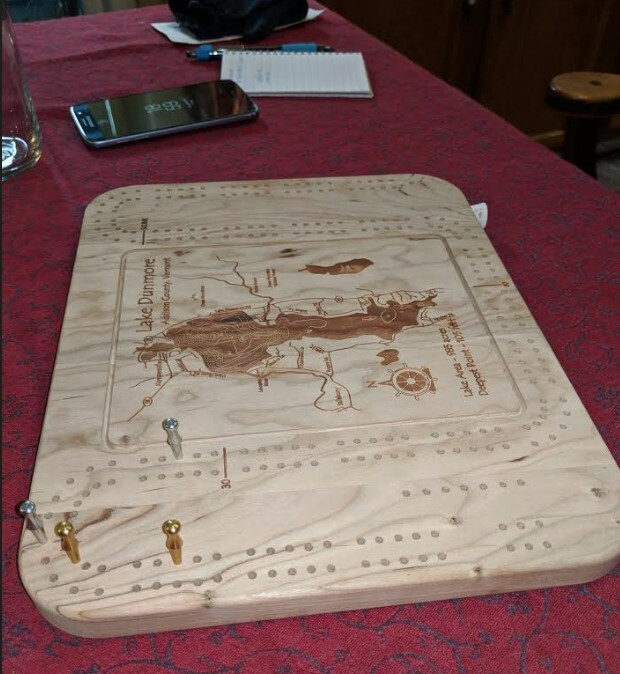 Such a cool, unexpected, fun gift! I love it. Well, I need to get moving - I've got a conference call in 15 minutes and another one after that. Happy weekend everyone - enjoy!! This will be a rather quick post as I am back to work and it is busy, busy, busy. I had hoped to walk yesterday, but the wind never stopped until dusk. It was mild - like 60 degrees, but my ears bother me whenever I'm out in the wind (even if they are covered). Funny how a year ago it was 1 degree! What a difference. So, anyway, I spent the day knitting and working on a jigsaw puzzle and I had a nice nap in the afternoon. 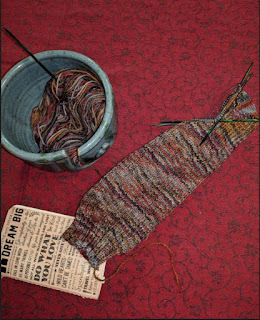 I'm into the gusset decreases on the foot, so it shouldn't take too long now (probably just jinxed myself). Hoping to finish by the weekend. I've ordered yarn to knit a cowl for Fletch and that should arrive by the weekend or early next week. Stay tuned on that one...I will be making up the pattern as I go (fingers crossed it will work). He wants the cowl knitted flat and then buttons (and button holes) added. And he is so darn picky over things. I was going to do cables, but he doesn't want that. I *think* I've worked out a pattern that he likes...need to try it on a swatch to be sure. Reading-wise I am still working my way through "The Feather Thief" and thoroughly enjoying it. I'm only about a third of the way through - I seem to be reading slowly these days. 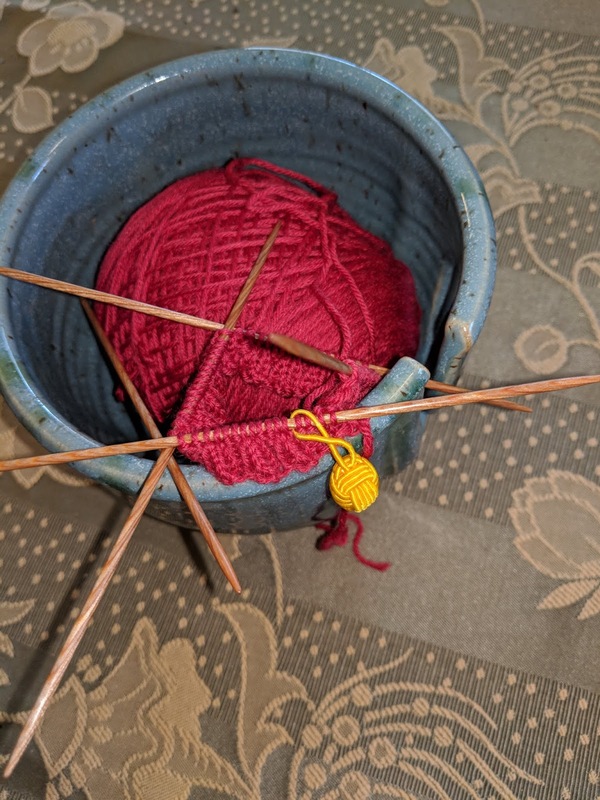 I hope to go back through my journal soon where I am tracking books and knitting projects and have a summary post for 2018. OK - back to the grind. I've got a ton of reports to do so I'd best get cracking!! Our celebrations last night were typical – very quiet. Usually I make a crab quiche for dinner, but we decided to do BBQ shrimp (New Orleans style) instead. 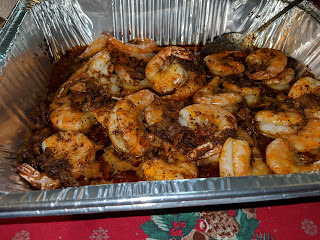 It’s a favorite dish and you can just about feel your arteries clogging from all the bacon and butter!! It was good and we had a salad to go with it and some bread (to mop up all that delicious juice!!). 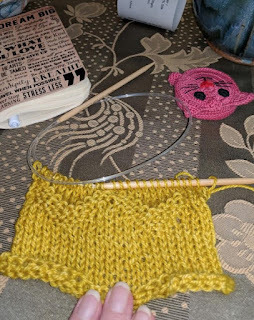 The evening was spent watching some TV, working on a jigsaw puzzle, reading and knitting. I went to bed at 10:30 and we completely forgot to open the champagne!! Age…..
Today has started off well. Coffee and knitting early and then I made cinnamon pecan waffles for breakfast. I have a bit of laundry going. I’d like to undecorate the tree, but I know Fletch wants it up a bit longer, so I’m not even suggesting it! The balance of the day will be spent knitting, napping, reading a bit. I’m hoping to take a walk, but right now it is very windy out, so maybe later. We’ll see. I have my “One Little Word” for 2019 and it is STRENGTH. I mulled over a number of words, but this one kept coming back to me. I’d like to gain more physical strength, but also emotional and mental strength as well. Strength of the Spirit perhaps. To find out what word others have chosen (or what word has “found” them), hop over to Juliann's Blog. Meanwhile, it’s time for me to get back to some knitting!